Frisky's demeanor and pupil size can offer hints about her health. A cat's eyes are very expressive and can tell you a lot about her mood and health. When Frisky is very playful or feeling stressed, her pupils can become very large to reflect her feelings. Sometimes dilated pupils can be a signal that something's not quite right. A cat's pupil is an elliptically-shaped opening in the iris that allows light to pass to the retina. It dilates or constricts according to the amount of light that enters Frisky's eyes. If she's in a dim room with little light, her pupils will be large in order to take in more light for improved vision. If she's in a bright spot, her pupils will shrink to decrease the amount of light going to her retina. According to VCA Animal Hospital, "Anisocoria is a condition in which the two pupils of the cat's eye are different sizes; in other words one pupil is larger than the other. In some cases, the abnormal pupil may be the one that is smaller and in other cases the abnormal pupil may be the one that is larger." Along with different size pupils, you may notice Frisky's cornea is cloudy or bluish in color, a droopy eyelid, discharge from her eye or some squinting or pawing at her affected eye. Also, Frisky may not be as active as she usually is. If anisocoria happens suddenly, you should contact your vet immediately to minimize the chance that Frisky's eyesight is permanently affected. The vet will physically examine her and give her a detailed eye exam. Depending on the findings, more specific tests may be conducted, including blood tests, a cornea stain and pressure measurements. Anisocoria is a symptom that can indicate a variety of conditions. Causes of anisocoria include retinal disease, scar tissue between the iris and the lens, inflammation of the interior of the eye, corneal injury, decline in the amount of tissue in the iris, spastic pupil syndrome, glaucoma and a congenital defect of Frisky's iris. 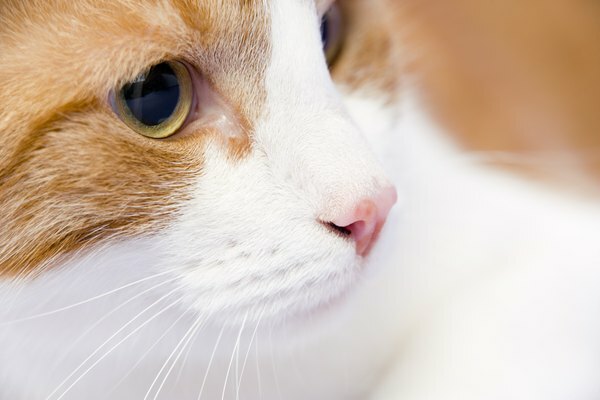 Treating anisocoria depends on what's causing it, so medications and treatment options depend on the individual cat's condition. Her prognosis for recovery also depends on the underlying cause. Hypertension, otherwise known as high blood pressure, includes dilated pupils among its symptoms -- along with weakness, disorientation and seizures. It's not unusual for cats with chronic renal failure or hyperthyroidism to have mild hypertension, so if Frisky has either of these conditions it's wise to keep an eye on her for signs of high blood pressure. A rare condition known as feline dysautonomia or Key-Gaskell syndrome can also result in dilated pupils. Key-Gaskell tends to affect cats younger than three years old and has no known cause. In addition to enlarged pupils, Key Gaskell has a long list of symptoms, including avoidance of light, vomiting, diarrhea, straining to urinate, coughing, depression, weakness and loss of appetite. Treatment for this condition is limited to addressing symptoms because the cause is unknown. Frisky's eyes should be clear and bright and the area around her eyeball should be white. If you gently roll her eyelid with your thumb, you should see that her lid's lining is pink, not red or white. In addition to uneven pupil size, other warning signs in her eyes include watering, discharge, tear-stained fur, a closed eye, a visible third eyelid or cloudiness or a change in her eye color. If Frisky has any changes in her eyes, you should contact your vet. Many eye-related conditions are treatable with prescribed drops or ointments. Left untreated, some eye conditions can lead to permanent blindness. What Does It Mean When a Kitty Comes & Taps You With Its Paw? What Happens When a Cat Is in the Final Stage of Death? Do Cat Pupils Get Bigger at Night? Why Does My Cat Lie in the Litter Box? Can Pain Cause Dilated Pupils in Cats?